When most people think of trading they mostly focus on investing. A slow accrual of wealth over time by holding. This is done by buying and holding stock, investing in mutual funds or ETF and waiting it out. However, this is not the only style of trading out there. So, what do you need to know about different styles? The first question about your style of trading comes in the form of time frames. You can invest and hold the investment for decades, or, you can trade in a faster pace. Instead of trying to accrue wealth slowly for retirement, you can try enjoying trading profits. They can outperform the buy-and-hold approach, but they also take a lot more effort. Let us delve a bit deeper into different styles of trading. Position trading resembles investing quite a bit. You’ll need a solid broker like Ally Invest. The traders who opt for it will use every analysis tool they have to make decisions. They rely on fundamental analysis to stay in the game. They will follow trends and usually ignore short-term changes. However, while most position traders like to hold their trades for months or even years, some work a bit faster. The main difference between position trading and investments is that an investment is meant to earn money from the fact that the market is on the rise while position traders still plan to use the standard buy low and sell high strategy, but they simply plan it out in longer time periods to maximize their profits. 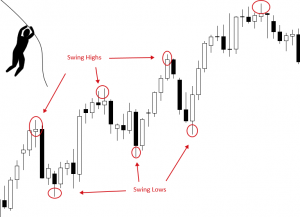 Swing trading is a very popular style of trading. It combines the best of two worlds. With the use of technical analysis, swing traders will use shorter time frames to profit from market moves. Usually, they will work in terms of weeks or even days. The reason this type of trading is popular is that traders who do not have a lot of time for trading every day can still use it to make a profit. The main idea is to exit a trade when you reach your profit desire, if the trade moved in the wrong direction too much or after the time limit was met. Day trading is a style of trading during which trades are finished during the same day. This means that the trader will both enter the position and exit it on the same trade. With day trading it is not very likely that a single transaction will bring a lot of profit. Instead, day traders will use tick or volume based chart intervals to profit from price fluctuations within a single day. They will follow prices in minutes and rarely hold trades for more than a couple of hours. Unlike investing, day trading is essentially a full-time position. It is a job. What do you get when you take day trading to the extreme? Scalp trading. This is the ultimate form of short-term trading. To make a profit, the trader will target the most minuscule price movements and make small gains. However, they will do so frequently and will build a profit every day. As a scalp trader, you will rarely hold a position for more than a minute. However, while the losses are minimal, this style is rather risky. To make a profit you will need a lot of positive trades. This is a very specific style of trading. To profit from it you will have to use rather complex algorithms. And they are, most of the time, proprietary to certain companies. These algorithms will provide analysis of multiple markets and execute orders themselves based on the conditions they find. When it comes to this style of trading execution speed is everything. For that reason, independent traders cannot really benefit from it. Glad to see investing isn't the only way to trade! Will definitely be considering some of these other options.